A new year is now underway. For many, that means a fresh start and the opportunity to make positive changes (both big and small) in daily habits and behaviors – from finally signing up for CrossFit to spending more time with family. But in addition to these common New Year’s resolutions, it can also be an opportune time to make some positive energy-related changes and upgrades around your home. If you haven’t really made any energy-related upgrades to your home in recent years, you might want to consider starting here. Replacing older bulbs with LED lighting is one of the most proven ways to make a major impact on lowering your home’s energy usage. Not surprisingly, lighting is a main source of electricity usage in the home – at roughly 12-15 percent on average. But modern LED bulbs use at least 75 percent less electricity than incandescent bulbs, according to the U.S. Department of Energy. Plus, they can last 25 times longer, so it could be well over five years before you have to think about replacing them again. In addition, the cost of these bulbs has gone down considerably in the past few years – while the quality of light and the variety of options have both improved. With costs at the current level, your new LED bulbs will pay for themselves in no time, especially with the rebates that are available now through most electric utilities, who are strongly encouraging consumers to make the switch. If you make no other energy resolutions this year, switching to LED bulbs will still make a major difference in your home’s energy usage. 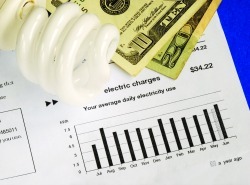 It’s easy to do yourself; it’s relatively inexpensive; and you’ll start seeing a difference as soon as your first bill. Most people that set New Year’s resolutions fail, and the most common reason is setting unattainable or unrealistic goals. So, in that vein, let’s stick with another resolution that you can accomplish with little financial or time investment – buying and setting up smart power strips. Smart power strips are new internet-connected versions of the same old surge protectors that you may have laying around your home. But instead of having to reach behind your entertainment center to turn them off, smart power strips (and smart outlets, which are a very similar product) can be remotely controlled through a mobile app or a voice assistant, like Google Home or Amazon Alexa. Why is this important? Well, you may not know this, but many appliances, like your cable box or coffee maker, are still drawing some power while turned off or in standby mode. In fact, some sources estimate that these “energy vampires” can use 10-20 percent of a household’s monthly electricity! For example, a 46-inch TV can draw about $11 worth of power each month even if it’s turned off. That’s where smart power strips and smart outlets come in. With these devices, which can be purchased for as little as $20, you can remotely cut off all power to energy vampires – and some smart power strips can even sense when an appliance goes into low-energy sleep mode and automatically turn it off. If you want to start small for your resolution, check to see if your electric utility has any rebates to help you purchase smart power strips or smart outlets. With just a few minutes of your time, you could be on the way to saving some serious money on your next power bill. What uses more energy in a home than both lighting and energy vampires combined? If you said “heating and cooling”, you’re correct! According to some estimates, heating and cooling accounts for about half of your home’s energy usage, and one of the easiest ways to rein in your heating and cooling expenses is by purchasing a smart thermostat. Unlike lighting and power strips, a smart thermostat can be a much larger monetary investment (think $150-250 for a top-of-the-line model), but like these other products, electric utilities often offer significant deals and rebates on smart thermostats. For example, through ComEd Marketplace, the e-commerce website for Illinois’ largest electric utility, the popular ecobee 4 is available now for only $99 after rebate, and the Nest Thermostat E for only $69 after rebate. So, can smart thermostats really reduce your home’s energy usage? And are they worth the investment? Well, that depends on a few factors – like how much energy you currently use around your home, the cost of electricity in your area and your region’s climate – but most signs point to yes. Although estimates vary, many suggest potential annual savings in the range of $130-180, so the device could pay for itself in the first year. If you want to make a slightly larger investment in making your home more energy efficient this year, a smart thermostat could be your best bet. There’s no silver bullet for reining in your home’s energy usage – but there are many easy ways to get started. And while the above resolutions can result in considerable savings on their own, if combined with each other and other time-proven tips (like those included here), you can see major improvements in your home’s energy efficiency. Here’s to a more energy efficient 2019! To learn more about ways that smart technology can make your home more energy efficient, read our blog here or check out our Internet of Things infographic here.